It’s always hard to talk about those few films you see that leave you completely befuddled – those “I liked it, but then again…” movies. For me, the recent Netflix Original release The Polka King (2018) is a movie like that. Even the simple choice of recommending or not-recommending this film eludes me. It’s enjoyable, but it’s also kind of boring. Hear me out. 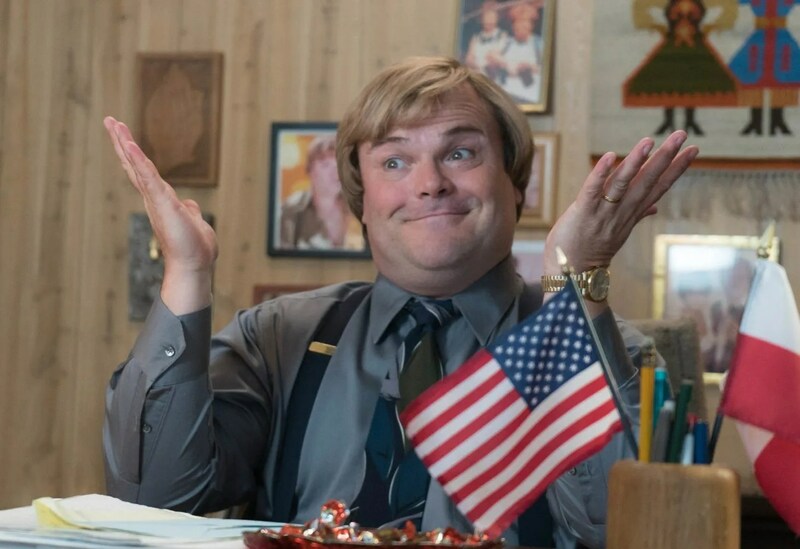 The Polka King follows the infamous exploits of Jan Lewan (Jack Black), the somewhat well-known Pennsylvania-based polka musician who ran a ponzi scheme about 20 years ago. When we are first introduced to Jan, we see a Polish immigrant who firmly believes in the American dream; that enough hard work will literally pay off and lead to success. Until he becomes an established name in polka (what the actual worth of that is I have no idea, but he gets nominated for a Grammy at one point), Jan works every menial and low-paying job he can with faith that he will eventually rise to the top. However, the music industry is not terribly kind to musicians’ finances, and Lewan struggles to get by with his wife Marla (Jenny Slate) and son David (Robert Capron). Their only extra source of income is a mall gift shop, and despite the constant criticism from his mother-in-law (Jacki Weaver), Jan is determined to “build an empire.” His long-time fans, elderly people with money to burn, approach him about investing in his band and Jan takes that money to help alleviate his financial stresses while promising high investment returns. The rest of the film follows Jan trying to maintain this scheme while actually attempting to make good on his promises. Polka is about the passion, man! As Reed describes in his Molly’s Game review, films about these kinds of “morally-grey” go-getter characters almost always portray them as scumbags that will get their comeuppance. The Polka King can’t seem to decide on how it wants to portray Jan, and the film ultimately suffers because of it. For the most part, director and co-writer Maya Forbes seems to go with a “come to your own conclusions approach” by simply showing us Jan’s actions and not really leaning one way or another towards characterizing Jan as well-intentioned but misguided or as completely malicious. To an extent, this does work. We know ponzi schemes are bad and lying is bad but I’m sure it’s not hard for many people watching this film to identify with his whole “fake it ‘till you make it” plan, and this certainly lends itself to good inter-character discussion. When you see your friend bring the Bob Marley (extra crispy). However, Forbes and Wallace Wolodarsky (the screenwriter along with Forbes) seem to forget the most crucial aspect to morally ambiguous characters: conflict. Within an instant, when Jan is presented with the opportunity to take investor money, he takes it and comes up with a lie about the returns without further hesitation. His motivations for doing so are presented well enough in the opening third of the film, but once he takes this serious plunge into white-collar fraud he doesn’t seem to have any kind of moral dilemma or stakes involved. The film becomes a screwball farce in which Jan goes around promising bigger things to his investors (more dividends, meeting the pope, etc.) while lying to his family about what he’s actually doing. He gets investigated at first by a government body, but he quickly lies his way out of this brief predicament. Your cousin got away with HIS ponzi scheme! All this frantic plot does, however, result in Marla having a moment of character development in the second half of the film. Marla Lewan feels like she has been relegated to Jan’s shadow in his attempt to create a sort of entrepreneurial cult of personality, so she decides to step out and do something for herself; enter the Miss Pennsylvania pageant in an attempt to relive her former glory as a pageant queen. It comes as no surprise to me after having seen Obvious Child (2014) and Landline (2017) that Jenny Slate can not only hold her own in a major or supporting role but even nearly overshadow the experienced Jack Black in their scenes together. Marla feels like she truly belongs in a dark comedy, whereas Jan commits to his mildly amusing farces of no real consequence, so much so that he basically seems like he’s in the same place (almost literally) throughout the entire film. That’s the ultimate key to what I was trying to say before, isn’t it? Mild amusement. Nothing ever laugh out loud funny, but silly, and nothing that dramatically compelling, but interesting enough. Interesting that, of all the people to pull a scam like this, it’s a polka musician. If that in of itself is supposed to be “the joke,” the whole polka music thing, then I certainly wasn’t in on it. I will give this film a little more credit where it’s due. The Polka King addresses something that I’ve never seen a movie with this kind of subject matter discuss before, in regard to Jan’s victims. How blameless can these seniors be when they throw thousands of dollars at someone they think they can trust, expecting thousands more, and then expect the government to help them get their money back when they were resistant to regulations on this in the first place? Blame the Invisible Hand, I guess, or just downright foolhardy greed. A much bleaker movie than I anticipated. While this film, like most Netflix Original films, is enjoyable enough thanks to the always strong performances of Black, Slate, and the rest of the supporting cast, there just isn’t enough conflict going on in the script for me to understand exactly how to feel about our protagonist. It’s hard to tell whether Jan is good-hearted but misguided or is deep down truly malicious, although the film seems to lean more towards the former. This film is no The Big Short (2015) or even The Wolf Of Wall Street (2013), but I really appreciate the film bringing to light the idea that the people who fall for these kinds of schemes are not blameless due to their greed and their contrarian attitudes towards government regulation. Previous Previous post: Molly’s Game (2017) Review: Ambitious, greedy, and roaring fun.